DEFENSE STRATEGIES FOR LOW SPEED IMPACTS. On June 24, 2013, the Supreme Court of the United States rendered an important pro-employer decision for Title VII employment retaliation claims in University of Texas Southwestern Medical Center v. Nassar. The Court determined that a plaintiff bringing a Title VII retaliation claim must show that the alleged adverse employment action against the plaintiff would not have occurred “but for” the plaintiff’s protected activity, meaning the plaintiff’s participation in protected activity must be the reason why the adverse employment action was taken against the plaintiff and not simply a motivating factor in the employer’s decision. The Respondent, Dr. Nassar, a physician of Middle Eastern descent, was a faculty member at the University’s Medical Center, and also at nearby Parkland Memorial Hospital. The University and the Hospital had an agreement whereby the Hospital was required to offer available physician positions to University faculty members. Dr. Nassar believed that one of his supervisors at the University, Dr. Levine, was biased against him based on his religion and national origin. Dr. Nassar alleged that Dr. Levine was overly critical of his billing practices and productivity, and that Dr. Levine made several derogatory comments about Middle Easterners. Dr. Nassar complained about Dr. Levine to his supervisor, Dr. Fitz. Dr. Nassar subsequently resigned from his position at the University and, at the same time, arranged to work exclusively at the Hospital. Around the time of his resignation, Dr. Nassar sent a letter to University faculty members stating that he resigned due to Dr. Levine’s harassment. Dr. Fitz was upset that Dr. Nassar humiliated his colleague, Dr. Levine, and he wanted public exoneration for her following Dr. Nassar’s letter alleging harassment against her. As a result, Dr. Fitz objected to the Hospital’s offer of employment to Dr. Nassar, and, because of Dr. Fitz’s objections, the Hospital withdrew its employment offer to Dr. Nassar. In response, Dr. Nassar filed a federal lawsuit against the University alleging that Dr. Levine’s racially and religiously motivated harassment resulted in Dr. Nassar’s constructive termination from the University, thus violating Title VII’s prohibition against discrimination based on protected status. The complaint also alleged that Dr. Fitz’s efforts to have the Hospital’s employment offer to Dr. Nassar withdrawn violated Title VII’s prohibition against retaliation for protected employee action. The jury returned a verdict in Dr. Nassar’s favor as to both causes of action. On appeal, the Fifth Circuit vacated the constructive discharge discrimination claim, but affirmed the retaliation claim by finding that Title VII retaliation claims require only a finding that the plaintiff’s protected activity was a motivating factor in the employer’s decision to take the adverse employment action, not its but-for cause. The retaliation claim was appealed to the Supreme Court, which reversed the Fifth Circuit by holding that for Title VII retaliation claims, a plaintiff must prove that the adverse employment action occurred because of the protected employee action —i.e. the only reason or the “but for” cause—instead of merely a motivating factor in the decision. The Supreme Court indicated that under tort law principles, the default causation standard in retaliation claims under Title VII must be the “but-for” test. Absent contrary language in the statutes, courts must make this assumption. This is particularly true for a highly detailed and structured piece of legislation such as the Civil Rights Act. Further, Congress had the opportunity to change the causation standard for retaliation claims in 1991 when it changed the causation standard for discrimination claims to the motivating factor test, but it declined to do so for the retaliation clause in the statute. The Court also took into consideration the ever-increasing rise in Title VII claims, particularly retaliation claims, and expressed its concern with the allocation of resources in the judicial and litigation systems. A lower causation standard results in more claims, and more claims create more costs for the courts, taxpayers and employers. Accordingly, the Court was reluctant to open up the floodgates further by lowering the standard of proof required for retaliation claims. For Title VII discrimination claims, the Court acknowledged that the standard is still the lesser motivating factor test, and not the heightened but-for causation test, which has now been adopted by the Supreme Court for Title VII retaliation claims in Nassar, and also age discrimination claims under the Age Discrimination in Employment Act (“ADEA”) with the Supreme Court’s decision in Gross v. FBL Financial Services, Inc., 557 U.S. 167 (2009). The Court’s decision in Nassar also relied in part on its prior decision in Gross that adopted the but-for standard for age discrimination claims by stating that the language in the ADEA is similar to the language in the Title VII retaliation clause that makes it unlawful to take adverse employment action “because” of certain criteria or protected activity. Nassar is an excellent decision for employers and employment practices liability insurance carriers. It should make it more difficult for plaintiffs to prevail at trial on Title VII retaliation claims because of the heightened “but-for” causation standard they must prove. When a plaintiff files a Title VII retaliation claim, the employer’s attorney should immediately assert the “but-for” causation defense and cite Nassar. Throughout the entire litigation the employer’s attorney should emphasize this defense. Retaliation claims are one of the most common, if not the most common, type of employment law claims filed in the United States. Over the next few years, it will be interesting to see if the Nassar decision results in a reduction of the number of retaliation claims filed by plaintiffs’ attorneys and/or an increase in the number of Title VII discrimination claims in which the lesser motivating factor standard is still used. It will also be interesting to see if state courts’ decisions in the coming years adopt the Nassar “but-for” causation standard for state civil rights laws and other state statutes protecting against retaliation such as whistleblower retaliation or workers’ compensation retaliation. In the meantime, all employers, claims professionals and defense attorneys should consider making the argument that the “but-for” causation standard applies in defending all types of employment retaliation claims, not just Title VII retaliation, particularly when the state statute at issue contains similar language to the Title VII retaliation clause or ADEA for which the “but-for” standard was adopted by the Supreme Court. The materials contained in this Announcement are for informational purposes only and not for the purpose of providing legal advice. For advice about a particular problem or situation, please contact an attorney of your choice. 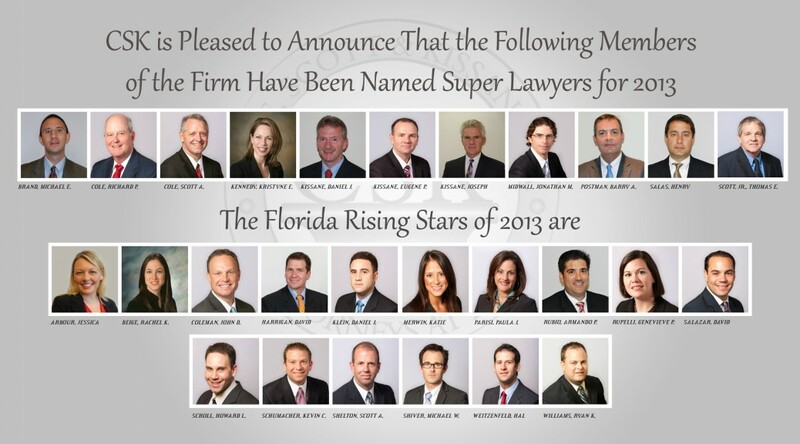 Eleven of Cole, Scott & Kissane’s attorneys have been named as Super Lawyers for 2013 and 16 attorneys have been named as Rising Stars. Many thanks for their hard work and dedication to our clients.